The Sticky Waterfall. Just the name is enough to pique your curiosity. At this natural wonder in Chiang Mai, everyone seems to suddenly gain Spider-Man superpowers as they defy physics and scale this innocent-looking 100-meter waterfall. 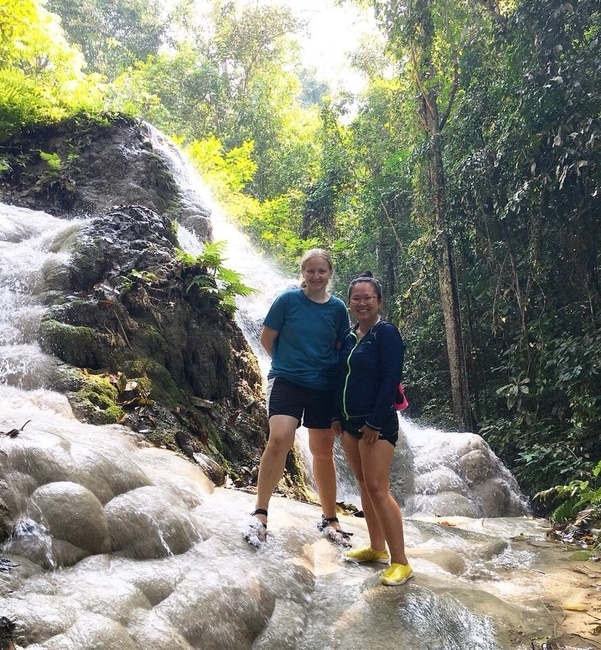 The Sticky Waterfall, or Bua Tong Waterfall as it’s officially called, is one of a kind and it isn’t hard to see why both Chiang Mai locals and travelers love it. Among the fans of the Sticky Waterfall is our Super Local Expert and winner of the TakeMeTour Best Local Expert Award in 2017, Khun Piangduan or Khun PD. A Chiang Mai native who has been visiting Bua Tong Waterfall for over 20 years, Khun PD loves to introduce this hidden gem to travelers from all over the world. In the end, though, it’s not just the Sticky Waterfall that’s stuck in her traveler friends’ memories. You might wonder why such an unusual waterfall isn’t one of the top attractions in Chiang Mai. I did, too, but I soon learned the answer from Khun PD. Bua Tong Waterfall is quite out of the way, requiring about 1.30-hour drive from Chiang Mai Old City. It takes some effort to get there, but there are things that keep Khun PD coming back to the fall. Even back when the path was unpaved and the toilets… primitive. Apart from its crystal clear water, she finds peace of mind amid nature. Now Bua Tong Waterfall area has certainly become more developed than before, but despite the changes, the waterfall remains beautiful and the forest well-preserved. It’s still Khun PD’s most favorite fall and her personal recommendation for Chiang Mai visitors. 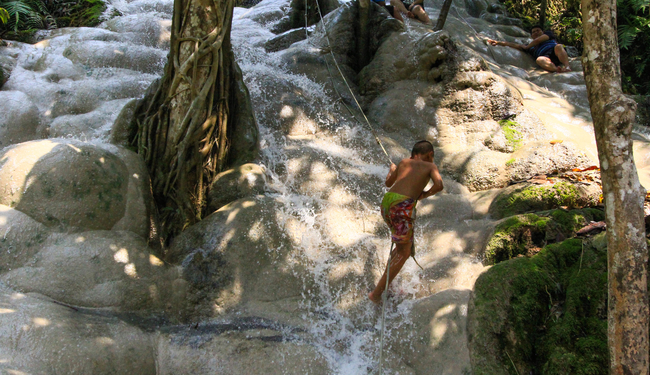 Sure, Bua Tong Waterfall is a nice swimming spot, but it’s the climbability that sets it apart from other falls. The secret behind this is limestone-coated rocks. Thanks to the mineral deposits on the rocks and stones, the waterfall surface becomes sticky, allowing you to hold onto it and climb up. While climbing is highly encouraged at the Sticky Waterfall, you can never be too careful. Slipping down isn’t unheard of since there are algae on some rocks. 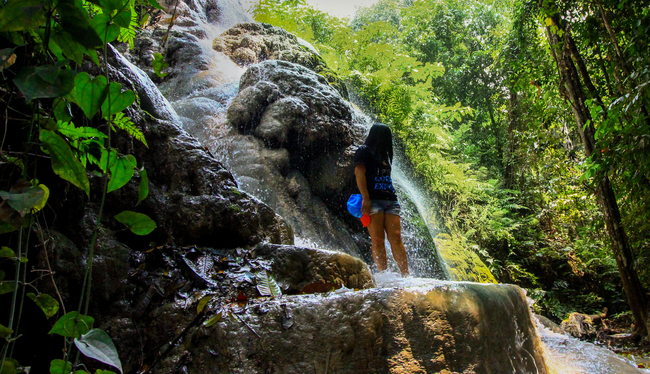 As the Local Expert on the Sticky Waterfall, Khun PD knows the safest spots to climb and she also takes action. Every time she takes her guests there, she goes into the water with them and shows them where to step onto and grip. She has seen a lot of travelers overcoming their fears and shared a story about one of her guests who has mobility impairment. It was one of Khun PD’s most memorable trips and she was glad she was a part of the traveler’s journey. While it’s the Sticky Waterfall itself that first draws travelers to Khun PD’s tour, Khun PD herself is also the trip’s highlight. “To be honest, I’m not very good at starting a conversation,” Khun PD revealed. However, she tried her best. Khun PD is very caring and sincere and it shows in her words and actions. All her guests felt it and they have become good friends. Khun PD makes sure every part of the journey is a great experience for her guests. She checks her guests’ food preferences and always meets them. The food Khun PD prepares for picnic at the Sticky Waterfall comes from her uncle and his wife’s cooked-to-order restaurant, Pa Jaew Tam Sang in San Sai District (also home to Khun PD’s café, Moon Café). Since many northern Thai food contains pork, Khun PD and her family cook Pad Thai for vegetarian travelers. Their Pad Thai is specially prepared to make sure it stays delicious no matter when the guests have it. 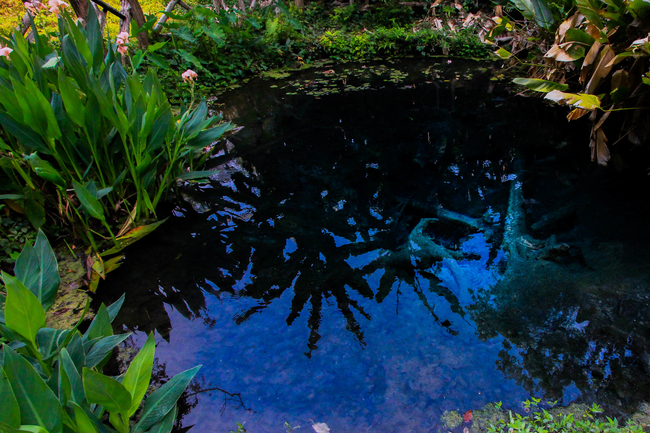 Once arrived the Bua Tong Waterfall area, Khun PD not only take her guests to the fall, but also to Jedsee Fountain and Bua Tong Cave. She shared with them the local legends, so they can immerse themselves in the places. At the Sticky Waterfall itself, she never rushes her guests and makes sure everyone gets the most out of the trip. She has taken care of the elderly and the children. The reviews that all travelers left for Khun PD speak volumes about how it’s not just the destination that matters. Who you travel with, what you have experienced together along the way, these things make the journey all the more beautiful and unforgettable. Meet the Local Expert is a series focusing on TakeMeTour Local Experts and their uniquely local trips. Every month we meet and interview a Local Expert for their inspiring stories while shedding light on Thailand’s local sides that are still unknown to most travelers. This month’s Meet the Local Expert features Khun Piangduan (khun is a Thai honorific added before a name). Meet and discover a local side of Thailand with her here.